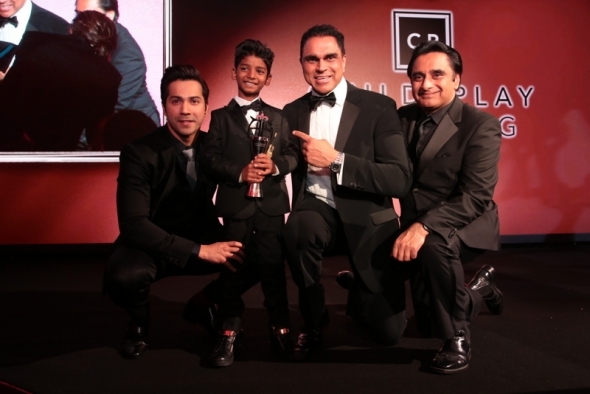 BOLLYWOOD stars Varun Dhawan and Anupam Kher were among the celebrity guests at The Asian Awards in London last night, toasting the success of ‘little lion’ Sunny Pawar. The child actor, who is from Mumbai, won the Rising Star award for his performance in the film, ‘Lion’ which also starred Dev Patel. India’s most famous cricketer Sachin Tendulkar was also feted and handed a Fellowship Award, which has only been awarded to three other people in The Asian Awards seven-year history. The other recipients are the late Ravi Shankar, actors Sir Ben Kingsley and Jackie Chan. There was also a special tribute to the actor Om Puri, whose wife Nandita and son, Ishaan were there to collect the outstanding achievement in cinema award. London Mayor Sadiq Khan attended, as did deputy business mayor, Rajesh Agrawal. Khan in a media interview laid down a challenge to new British world heavyweight champion Anthony Joshua – saying he was ready to box him…but then jokingly retracted. Sadiq’s brother Sid is a boxing coach and heads up the Earlsfield South London ABC Boxing club. Elsewhere in the entertainment field, Bollywood singer Adnan Sani took away the outstanding achievement in music accolade. Channel 4 newscaster Krishnan Guru-Murthy collected the outstanding achievement in television award. Sanjeev Bhaskar was the compere for the awards held at the Hilton Hotel, Park Lane. Among the other celebrities who attended were Lindsay Lohan, Meera Syal, Greg Rusedski, and Bollywood star Amy Jackson. There is currently a problem with viewing the gallery pictures (ie, click to enlarge). We hope to have it fixed soon. Apologies.